“7 For there are three that bear witness in heaven: the Father, the Word, and the Holy Spirit; and these three are one. 8 And there are three that bear witness on earth: the Spirit, the water, and the blood; and these three agree as one” (1 John 5:7-8). The Bible teaches that there is just one God or Godhead, but this one Godhead involves three distinct persons. In a discussion with a Jewish scribe, Jesus referred to the Old Testament Scriptures which taught that God is one Lord. The scribe had asked, “Which is the first commandment of all?” Jesus answered him, “The first of all the commandments is: ‘Hear, O Israel, the LORD our God, the LORD is one” (Mark 12:29). Jesus here referred to the statement of Moses as found in Deuteronomy 6:4-5. The Jews worshiped just one God in contrast to the polytheism of the pagan nations surrounding them. We are to worship and serve one God, and yet, God is not one person. The New Testament teaches that Jesus Christ is the fullness of the Godhead bodily, which simply means that he possesses all the powers and attributes of the deity. Paul said, “For in Him dwells all the fullness of the Godhead bodily” (Colossians 2:9). When Jesus Christ assumed bodily form, and lived upon the earth, he exhibited all the marks of the divine nature. Philip once asked the Lord to show him the Father, whereupon Jesus replied, “Have I been with you so long, and yet you have not known Me, Philip? He who has seen Me has seen the Father; so how can you say, ‘Show us the Father’” (John 14:9)? On another occasion the Pharisees asked Jesus, “Where is Your Father?” Jesus replied, “You know neither Me nor My Father. If you had known Me, you would have known My Father also” (John 8:19). This is what Paul meant when he said that all the fullness of the Godhead dwelled bodily in Christ Jesus. 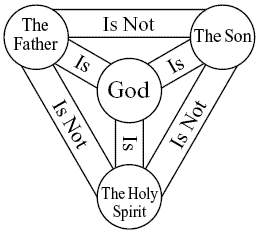 Let us notice that the Bible applies the noun God to the Father, the Son and the Holy Spirit. The Bible even uses the phrase “God the Father” to refer to the first person of the Godhead. In John, Jesus said, “Do not labor for the food which perishes, but for the food which endures to everlasting life, which the Son of Man will give you, because God the Father [Emphasis SGF] has set His seal on Him” (John 6:27). Observe that in this verse two persons are mentioned: one is the Son of Man, a phrase which denotes the humanity of Jesus Christ. He was made flesh and dwelt among us, and he suffered and died in order that he might be one of us. The Hebrew writer says, “Inasmuch then as the children have partaken of flesh and blood, He Himself likewise shared in the same, that through death He might destroy him who had the power of death, that is, the devil” (Hebrews 2:14). But there is another person mentioned in this verse and that is God the Father. Now the Father had sealed his Son, that is, he had approved of his Son, and had sent his Son into the world to give himself a ransom for many. No one then can deny that the Bible makes reference to the first person of the Godhead, namely, God the Father, unless they deny the plain teaching of the Bible. Several other passages of Scripture also refer to the Father as God. Let us notice these: Paul said to the Romans, “That you may with one mind and one mouth glorify the God and Father [Emphasis SGF] of our Lord Jesus Christ” (Romans 15:6). In the First Corinthian letter we also read, “Yet for us there is one God, the Father, of whom are all things, and we for Him; and one Lord Jesus Christ [Emphasis SGF], through whom are all things, and through whom we live” (1 Corinthians 8:6). In his second letter to the Corinthians Paul stated, “Grace to you and peace from God our Father and the Lord Jesus Christ. Blessed be the God and Father of our Lord Jesus Christ, the Father of mercies and God of all comfort” (2 Corinthians 1:2-3). When Paul wrote his letter to the Colossians, he prayed for their well-being, saying, “That their hearts may be encouraged, being knit together in love, and attaining to all riches of the full assurance of understanding, to the knowledge of the mystery of God, both of the Father and of Christ.” [Emphasis SGF] (Colossians 2:2). This is one of the key passages of Scripture touching upon the doctrine of the divine Godhead in the entire Bible. You will notice the term mystery is used in connection with the subject of God. In the Bible the term mystery does not refer to something which is incomprehensible, but it refers to something which previously was unknown, but having been revealed, is no longer a mystery, but may be understood as clearly as any other subject in the Bible. “This does not mean that the mere fact of the existence of God was a mystery, or a truth which had been concealed, for that was not true. But the sense plainly is, that there were truths now made known in the gospel to mankind, about the mode of the divine existence, which had not been disclosed; and this mystery he wished them to retain, or fully acknowledge. The mystery or the hitherto unrevealed truth, related to the fact that God subsisted in more persons than one, as Father, and as Christ” (Albert Barnes, Barnes on the New Testament, Ephesians and Colossians, pages 260-261). The Old Testament Scriptures taught the plurality of the divine Godhead, but not as clearly as that which is revealed in the New Testament. What Paul wished his readers to understand was simply that God, the divine nature, expressed itself through the person of the Father and the person of Jesus Christ. Oneness teachers definitely cannot answer the plain teaching of this in regard to the plurality of the persons of the Godhead. We have already pointed out that the Bible speaks of the first person of the Godhead under the phrase, “God the Father,” but this same Bible plainly teaches that God is expressed in the person of Jesus Christ. Therefore Paul rose to the very heights of inspired eloquence when he said, “And without controversy great is the mystery of godliness: God was manifest in the flesh” (1 Timothy 3:16). There is God the Father, and there is also God the Son. Let us notice just a few verses of Scripture which affirm that the Son, Jesus Christ, possesses the same divine nature or deity which his father possesses. Out of all the terms and phrases which are applied to Jesus Christ, none expressed his essential deity any better than the phrase, “the Word.” In the prologue of the Gospel of John, the eternity of the word, the society of the word, and the deity of the word are all affirmed. John said, “In the beginning was the word, and the word was with God, and the word was God. The same was in the beginning with God” (John 1:1-2). Observe that in the beginning when God created the heaven and the earth, the Word, Jesus Christ was there. The Bible also speaks of the Holy Spirit as God, that is, of possessing the divine nature. The Holy Spirit was in the beginning when the heavens and the earth were created (Genesis 1:1-2). Shortly after the church had been established, Ananias and Sapphira his wife lied about a certain contribution that they made to help the needy. Peter, by inspiration, exposed their deceitfulness. In keeping back part of the price of the land, Peter stated that Ananias had lied to the Holy Spirit. But then he stated that he had not lied unto man but unto God (Acts 5: 3-4). Therefore, the obvious conclusion is that the Holy Spirit was God or possessed the divine nature. In the gospel according to John, Jesus Christ, made one of the most startling statements that has ever been uttered from the lips of man, and had anyone else other than the divine Son of God made this statement it would have been presumptuous and pretentious. Jesus said, “I am the light of the world. Whoever follows me will never walk in darkness, but will have the light of life” (John 8:12). “Even if I testify on my own behalf, my testimony is valid, for I know where I came from and where I am going. But you have no idea where I come from or where I am going” (John 8:14). When Jesus bore testimony of himself his testimony was definitely true because he knew all things. But since the claims and pretensions of Jesus Christ were to be examined and tested in the court of humanity, the charge which the Pharisees made that the record of Christ was not true because he testified of himself, would have been considered true if there had been only one person in the Godhead. But Jesus was not by himself in bearing testimony of his divine nature, mission and work to redeem lost mankind. Jesus continued his reply to the Pharisees saying, “You judge by human standards; I pass judgment on no one. But if I do judge, my decisions are right, because I am not alone. I stand with the Father, who sent me. In your own Law it is written that the testimony of two men is valid. I am one who testifies for myself; my other witness is the Father, who sent me” (John 8:15-18). Observe that Jesus reasoned that when he bore testimony and passed judgment on himself that his judgment was absolutely true because he was not alone, but both he and the father that sent him were together. There are churches that teach that God is alone, that there is just one person in the Godhead and therefore he would have to be alone. If there were a roomful of people and everybody left the room but one person, that person would be alone in the room. But Jesus said that he was not alone, and if he was not alone, then there was someone with him. He affirmed that the one that was with him was the Father. “I am not alone, but I and the father that sent me” (John 8:16). Here is a basic axiom of arithmetic that one plus one equals two. In John 8:16, the pronoun “I” refers to Christ, and is first-person singular, and the phrase “the Father” is third person singular. Therefore there were two persons of whom Jesus made mention, himself and his Father. Jesus appealed to the teaching of the Old Testament law to the effect that the testimony of two men is true. “And yet if I judge, my judgment is true: for I am not alone, but I and the father that sent me. It is also written in your law, that the testimony of two men is true. I am one that bear witness of myself, and the Father that sent me bears witness to me” (John 8:16-18). Moses had said, “At the mouth of two witnesses, or three witnesses, shall he that is worthy of death be put to death; but at the mouth of one witness he shall not be put to death. The hands of the witnesses shall be first upon him to put him to death, an afterword the hands of all the people. So thou shall put the evil away from among you” (Deuteronomy 17:6-7). This same principle is also reaffirmed in the New Testament by Jesus and his apostles (Matthew 18:16; 2 Corinthians 13:1; Hebrews 10:28). On the basis of what the law said then concerning the truth of a man’s record, Jesus made the following logical argument that his record was true. Major premise: the testimony of two persons is considered true in a court of law. Minor premise: Christ bore witness of himself, being one person, and his father also that sent him more witness of him, being a second person. Conclusion, therefore the record of Christ is true. But now let us examine the doctrine that there is just one person in the Godhead in light of the argument made by Christ. The argument made by Christ would be nonsense if there were only one person in the Godhead, for Jesus quoted the law to the effect that the testimony of two persons is true, and then Jesus cited the testimony of himself and his Father to prove that his record was true. Now if there is only one person in the Godhead, then Jesus would have been making a ridiculous argument. Jesus argued from the fact that there is more than one person in the Godhead to prove that his record is true. In his final argument with the Pharisees that his record was true, Jesus predicted that his death, burial and resurrection would be the final proof that he was God’s divine Son, and that what he said was true, and that he was not alone but in perfect agreement with his Father. “When you have lifted up the Son of Man, then you will know that I am the one I claim to be and that I do nothing on my own but speak just what the Father has taught me. The one who sent me is with me; he has not left me alone, for I always do what pleases him” (John 8:28-29). Twice in the eighth chapter of John, Jesus affirmed that he was not alone, but that his heavenly Father was with him, and approved of all that he did. Therefore, the Bible affirms that Christ, the Word, was with God in the beginning and it equally affirms that the Father was with the Son, and that he was not alone. Therefore there is more than one person in the divine Godhead. We have just noticed that there is more than one person in the Godhead. We have observed that Christ bore testimony of himself, and the Father that sent him bore testimony concerning him. Therefore, Jesus was not alone in bearing record of himself, but his Father also testified of his character and work. Then, Jesus was not alone, but his Father was with him, which definitely teaches that there are at least two persons in the Godhead. Both the Father and the Son testify to this great truth. But we wish to enumerate and discuss other witnesses which testified to the fact that there is more than one person in the Godhead. Let us notice these witnesses. The first witness whom we should consider is that of Jesus Christ. Jesus had been condemned by the Jews because he had healed a man on the Sabbath day. He affirmed that he was simply working as his Father worked. Some preachers either deny the Son or the Father by saying that there is only one person in the Godhead, but Jesus taught that men should honor both the Father and the Son: “That all may honor the Son just as they honor the Father. He who does not honor the Son does not honor the Father, who sent him” (John 5:23). Let us notice what Jesus had to say concerning his own character and work. Jesus said, “By myself I can do nothing; I judge only as I hear, and my judgment is just, for I seek not to please myself but him who sent me. If I testify about myself, my testimony is not valid. There is another who testifies in my favor, and I know that his testimony about me is valid” (John 5:30-32). If there were just one person in the Godhead, as some affirm, then Jesus would have been testifying of and by himself, and therefore his testimony, or witness, would not be considered true by men. But these verses, as you will observe, said his judgments were not made by himself alone, but in conjunction with the will of the father which had sent him. He uttered only that which he heard from his heavenly Father. Therefore his judgment was just and true because he was not alone, but worked with his Father that sent him. This again reminds us of the answer Christ gave to the Pharisees who said that his record was not true because he bore testimony of himself. Jesus replied: “though I bear record of myself, yet my record is true” (John 8:14). His record was true because he did not bear record by himself for he was not alone, but his father also bore witness of him (John 8:15-18). Having stated his own testimony concerning himself, Jesus presented the additional witness of John the Baptist. “There is another who testifies in my favor, and I know that his testimony about me is valid.” You have sent to John and he has testified to the truth. Not that I accept human testimony; but I mention it that you may be saved. John was a lamp that burned and gave light, and you chose for a time to enjoy his light” (John 5:32-35). When John the Baptist began preaching in the wilderness, the Jews around Jerusalem and Judea soon heard of his great work, and they sent out a delegation inquiring as to who he was and what he was doing. The Bible says, “John testifies concerning him. He cries out, saying, “This was he of whom I said, ‘He who comes after me has surpassed me because he was before me’” (John 1:15). To those whom the Pharisees sent, John denied that he was the prophet or the Christ, but affirmed that he was “the voice of one crying in the wilderness, make straight the way of the Lord, and said the prophet Isaiah” (John 1:23). John also gave this additional testimony concerning Christ, “I baptize with water,” John replied, “but among you stands one you do not know. He is the one who comes after me, the thongs of whose sandals I am not worthy to untie” (John 1:26-27). In fact, when John the Baptist baptized Jesus, he later looked back upon that great event and bore testimony that Jesus Christ was the Son of God: “And John bore witness, saying, “I saw the Spirit descending from heaven like a dove, and He remained upon Him. I did not know Him, but He who sent me to baptize with water said to me, ‘Upon whom you see the Spirit descending, and remaining on Him, this is He who baptizes with the Holy Spirit.’ And I have seen and testified that this is the Son of God” (John 1:32-34). The truth that Jesus is the Christ, the Son of God, was not solely dependent upon the testimony of John the Baptist. However, his testimony was true because it was inspired of God. Jesus Christ spent his entire ministry going about doing good (Acts 10:38). He raised the dead, healed the lepers, gave sight to the blind and healed men of all manner of sickness and disease. His works were truly stupendous works that could not have been performed without him being divine and all-powerful, for only God could do this; therefore, the works of Christ bore testimony that he was truly the divine Son of God, and that God was with him and approved of all that he said and did. Jesus said, “But I have a greater witness than John’s; for the works which the Father has given Me to finish—the very works that I do—bear witness of Me, that the Father has sent Me” (John 5:36). All the works that Jesus did that caused men to so marvel, and to be amazed, bore testimony that he was God’s Son and that God had sent him and was with him. Even Nicodemus, a ruler of the Jews, recognized that no man could do the works that Christ had done unless God was with him (John 3:1-8). After John had completed his work, and had borne testimony of Christ, he was put in prison by Herod. While in prison, John the Baptist heard of the great works which Jesus did, and he sent messengers to Christ inquiring, “Art thou he that is to come or shall we look for another?” Jesus sent messengers back with this reply, “Go and tell John the things which you hear and see: The blind see and the lame walk; the lepers are cleansed and the deaf hear; the dead are raised up and the poor have the gospel preached to them. And blessed is he who is not offended because of Me” (Matthew 11:4-6). The signs, miracles and wonders which Jesus performed then proved beyond a shadow of the doubt that he was God’s only begotten Son, and that God was with him (John 20:30-31). The only conclusion that can be drawn from this study is that there is one God that is expressed in the persons of the Father, the Son, and the Holy Spirit.